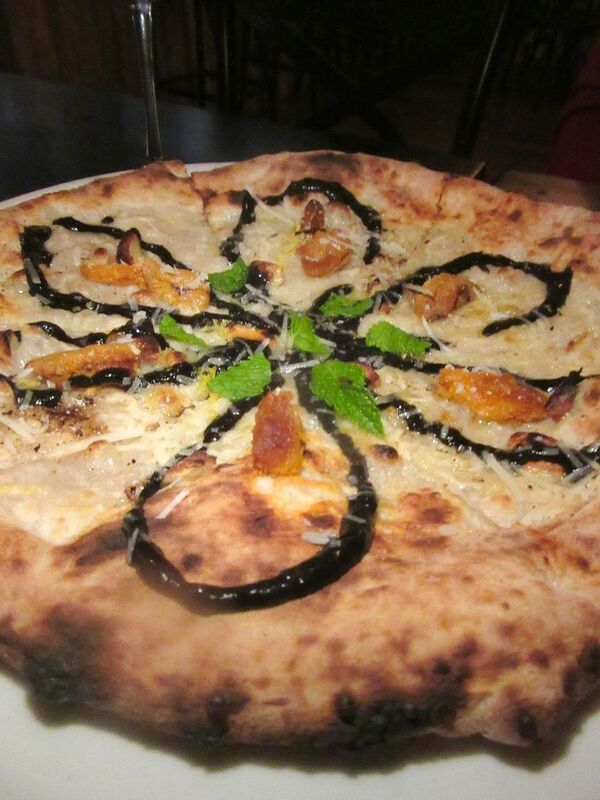 I asked for the uni-squid ink pie on Pecorino Ronmano “extra crispy.” It was marvelous. 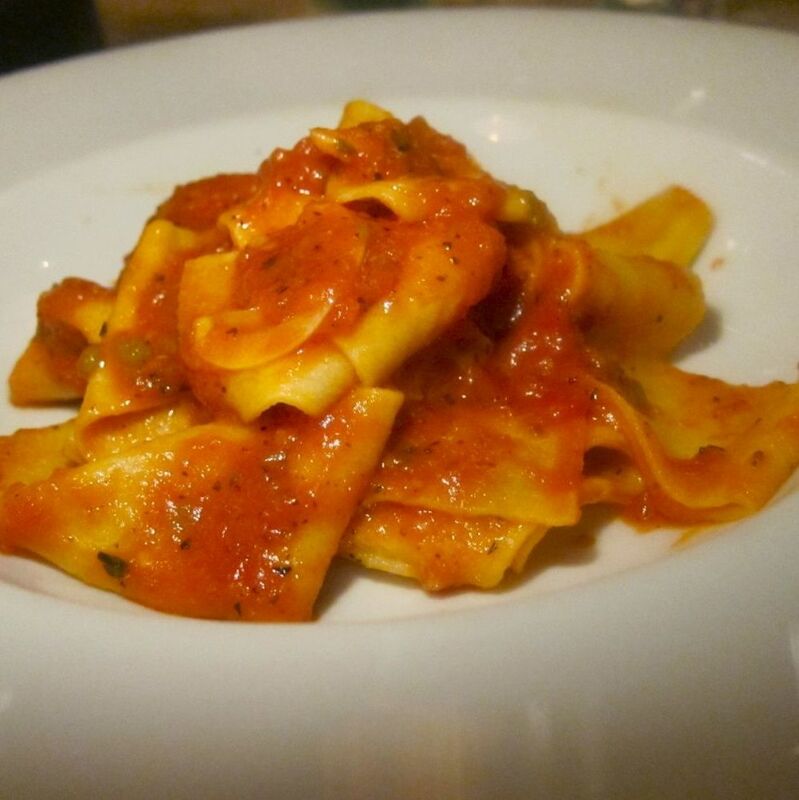 Prova proudly hails itself as “90 Seconds to Naples.” Here’s how to get there. 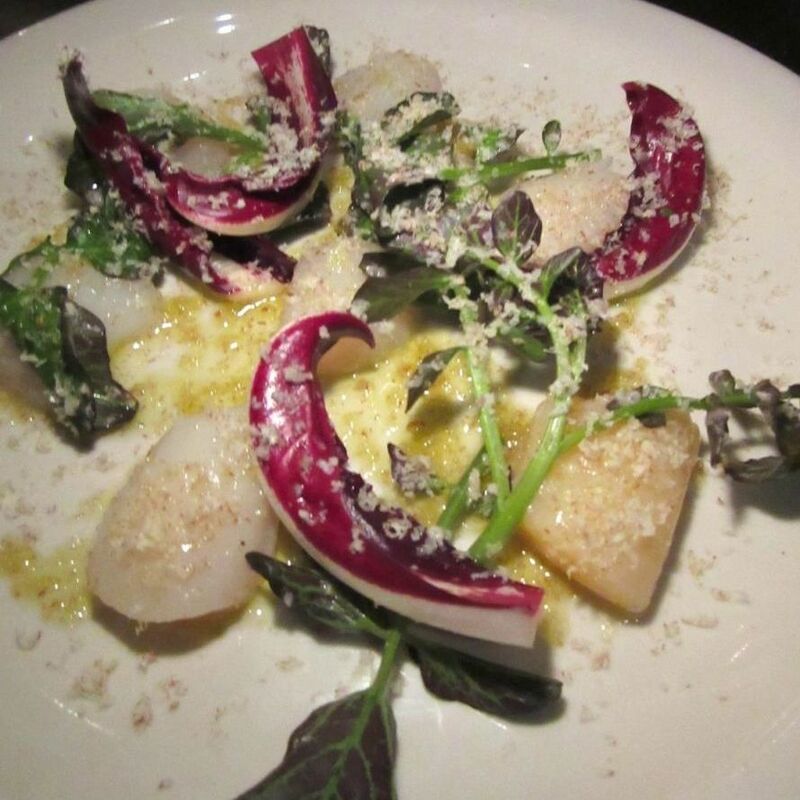 Put together a foursome and just walk into Prova early on its not-particularly-upscale stretch of Eighth Avenue. Try to get a table in the back before the uproar builds. 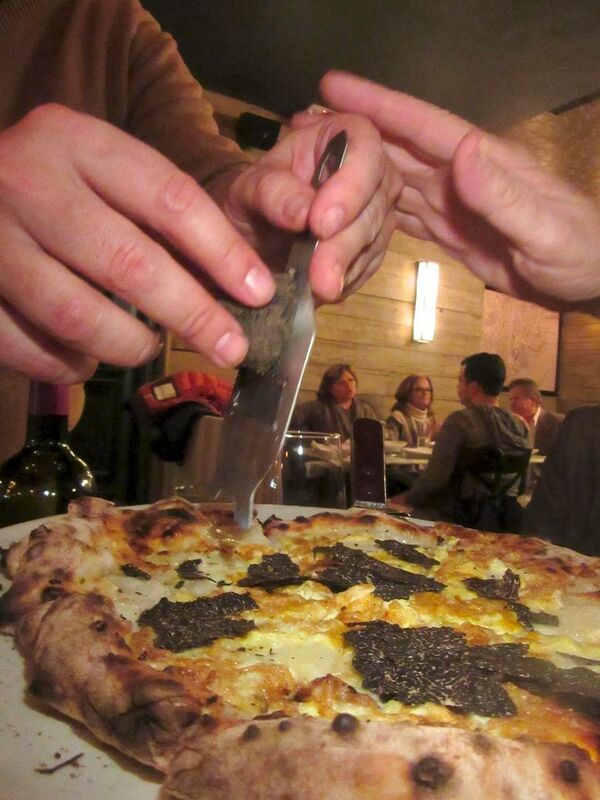 At friends preview, Maurizio shaves truffle on a lowly Neapolitan combo, eggs and pecorino. If you keep up on the pizza wars, you will have read that Donatella Arpaia’s aggressive lead partner here, wine dealer-restaurateur-uber Neapolitan Maurizio de Rosa, has ordained that the lardo is from Iberico, the oregano imported from Sicily, the pippali (pepper) is ground fresh in a mortar at the counter, the dough is fermented for five days, not 12 hours, and the sea urchin are sourced from the same elite fishmongers that deliver to Sushi Nakazawa, where he is also a partner. 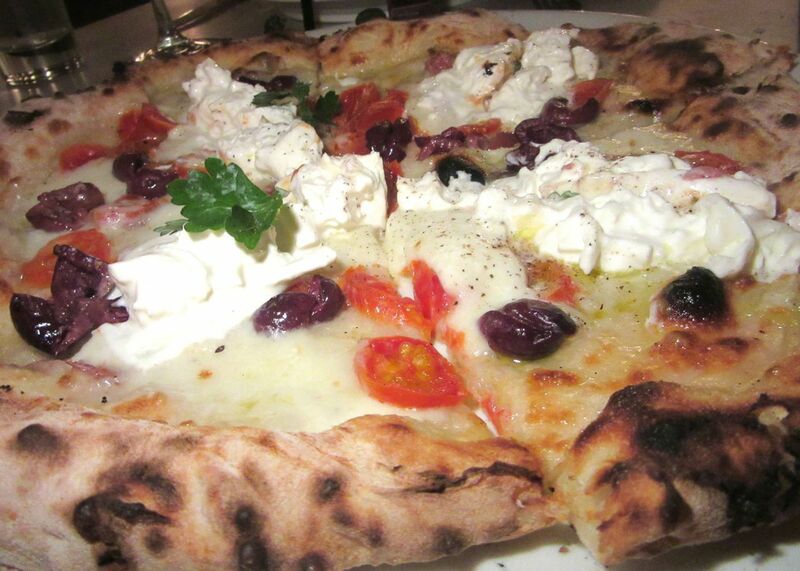 Vesuvias tomatoes, burrata, Gaeta olives, colotura of anchovies on the Cetara pizza. I am quoting now from de Rosa’s non-stop ravings. You can be sure the fior di latte is made fresh for Prova from Italian curd, that the colatura of anchovies from Cetera is the equivalent of the garum ancient Romans sold for the price of gold, and the mint leaves are fresh too, put on at the last minute. Ribalta chef Pasquale Cozzolino (ex-Keste) doubles as chef-partner here. All that much ado plus the fact that the renowned Italian craftsman Stefano Ferrara came himself from Italy to build this oven in gold for Donatella, brick by brick, instead of sending his usual prefabricated model, and returned to add a red-tiled veneer for this chapter. 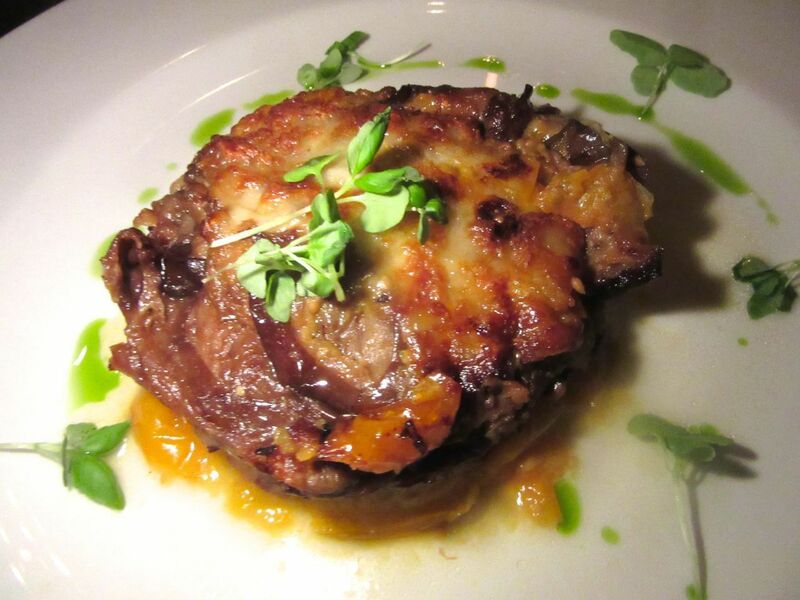 “When you get a chance to play with a Stradivarius, you take it,” Maurizio told Eater. 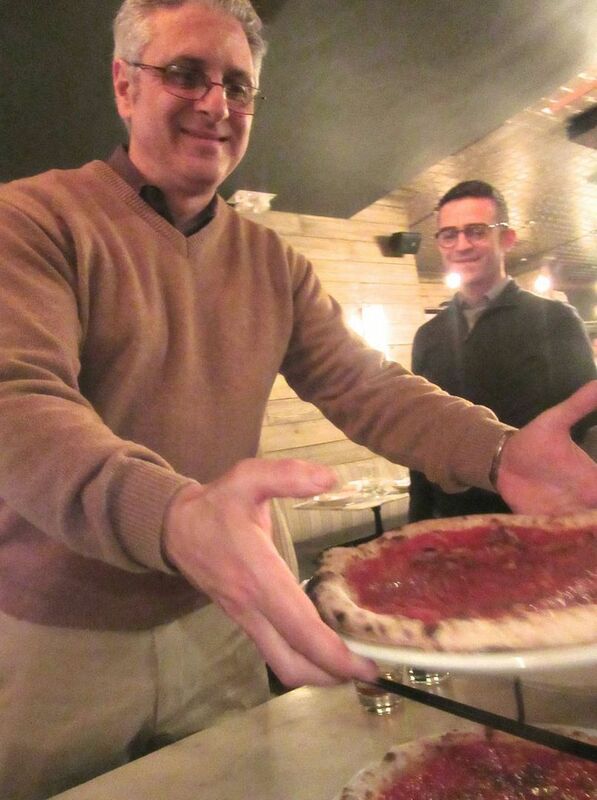 Rosario Procino of Keste Pizza and Ribalta, another partner, likened it to a Ferrari. 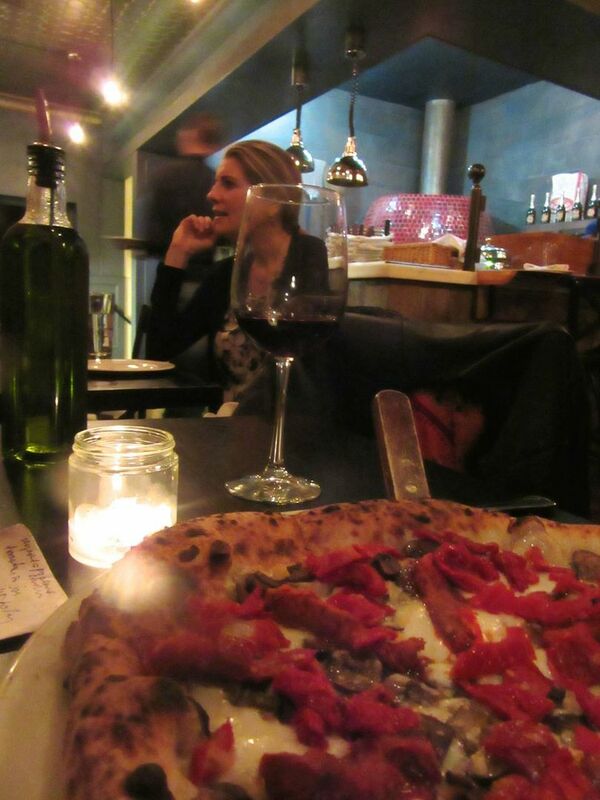 The wood is piled against a brick wall not far from where pizza paddles form a counter overlooking the kitchen action. A duo of classics are served from the double decker stand at family night. Now to begin. Order a bottle of red -- something Neapolitan, preferably -- from a list that is impressive for this neighborhood. 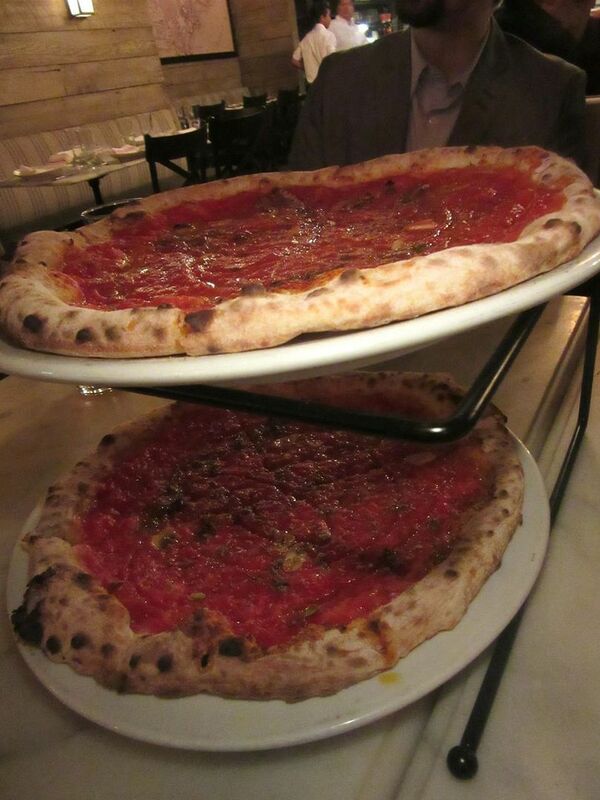 Choose a couple of pizzas, starting at $12 -- the Margherita if you’re a traditionalist, and then from the listings under “Novita,” the Calabresina with its torrid ‘Nduja sausage perhaps or the much talked about Unica with sea urchin and squid ink on Pecorino Romano. Discover why a pie is worth $29. 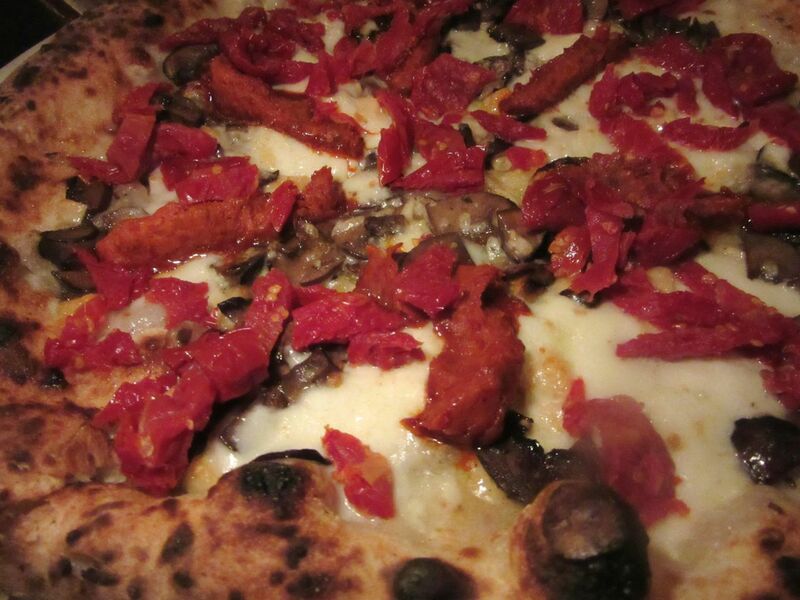 An island of torrid ‘Nduja sausage on the Provolone-lined Calabresian pie may catch you by surprise. The complexity of flavor in the dough itself is remarkable. It isn’t puffy and soggy like most Neapolitan pies. You might take home half a pie for breakfast, but you won’t leave shreds of superb crust piled on your plate. Of course I asked for it “extra well done.” Who needs bread? You ask. Well, the excellent bread that comes wrapped in a napkin is from the same dough and, very important, it’s cut to order. At least taste it. 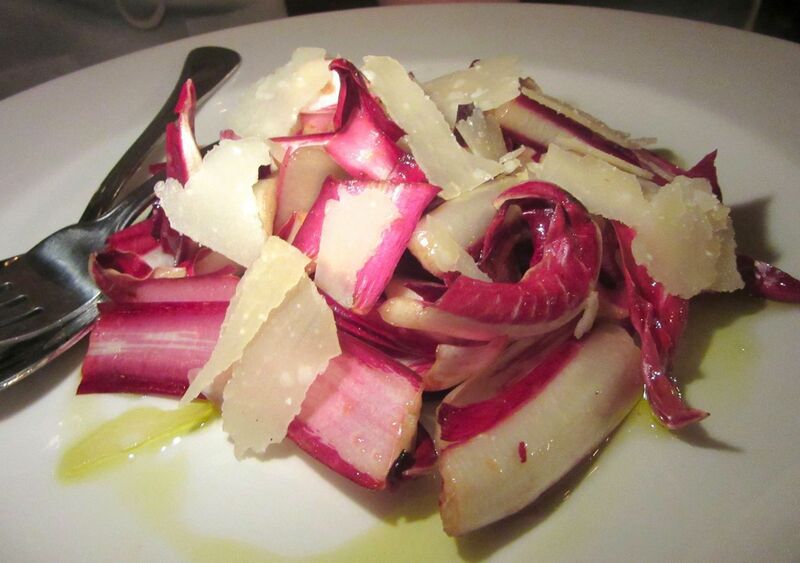 Mixed imported radichios are tossed with mache, olive oil and Maldon salt. Have a salad first, definitely the elegantly crisp imported puntarelle, bitter Roman greens you don’t see often, tasting miraculously fresh. Its season is ending soon. Notice the use of salt from Trapani. Local fennel with pomegranate seeds and blood orange in “The Chelsea” is exceptional, too. And don’t stop there. 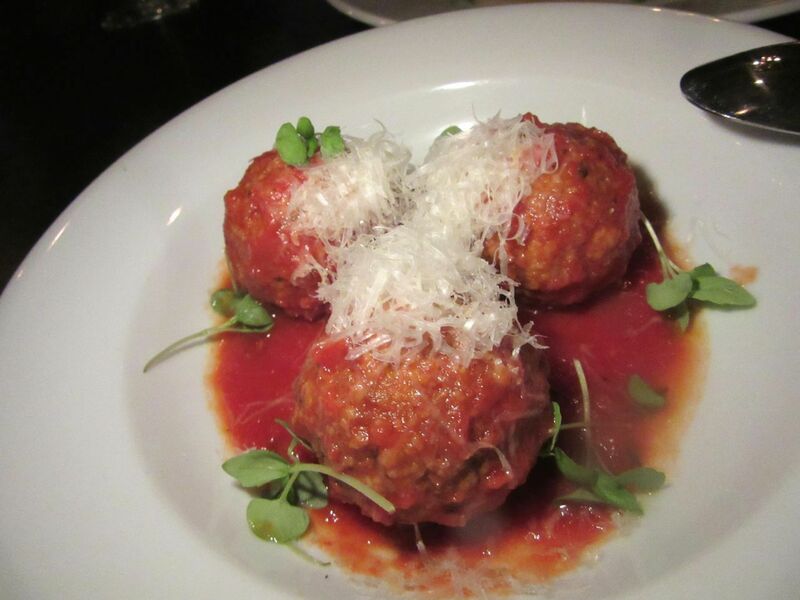 You’ll want Mama Arpaia’s prize-winning meatballs and a side of very good eggplant parmigiana too. “No meatballs,” Maurizio said with a snarl but, here they are, Mama Arpaia’s prize-winners. Overlook to your regret Chef Pasquale Cozzolino’s shockingly rich and luscious paccheri pasta topped with eggplant, gem tomatoes and a voluptuous sprawl of burrata. He was perfecting it in the cellar kitchen last week and when he brought a double portion to our table. I suddenly couldn’t remember ever eating a pasta that I liked more. It went on the menu last week along with a pasta classic, penne larded with sausage and broccoli rabe, each $22. 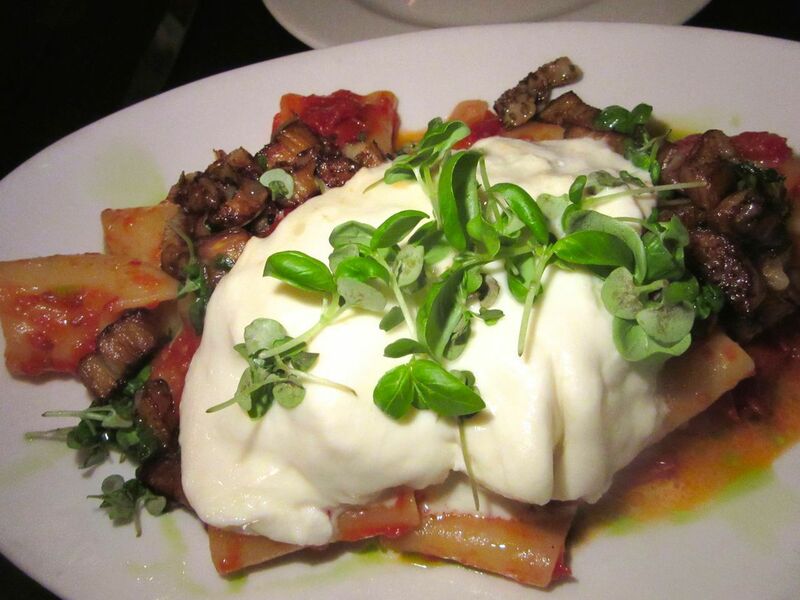 Impeccably cooked paccheri is topped with burrata, rare Vesuvius tomatoes, thrice cooked eggplant. Cozzolino explained the rarified origin of the paccheri -- properly al dente, it goes without saying -- and the aristocratic birthplace of the egg shaped tomatoes -- Pomodorino del Piennolo del Vesuvio -- flown from their volcanic “gated community” in vacuum packed jars. He confided the secret of the white eggplant -- boiled, roasted, sautéed. 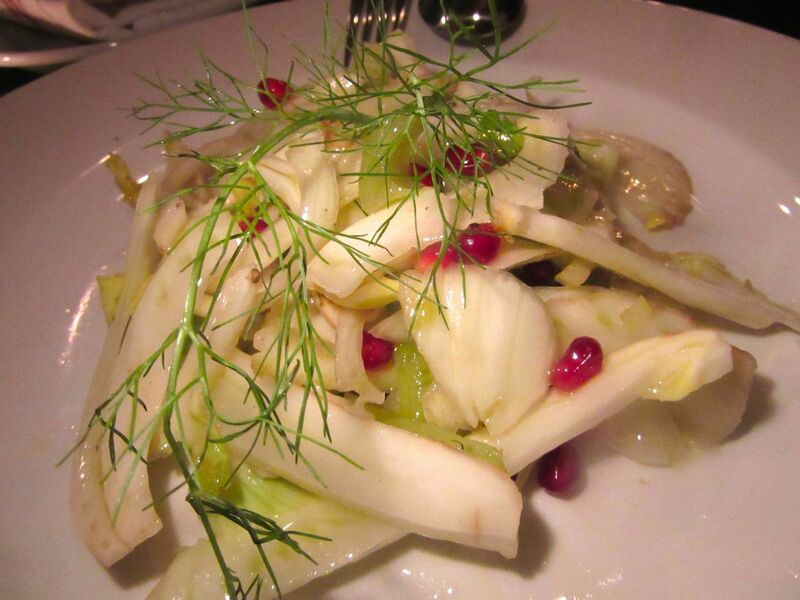 The Chelsea salad is local, clean and crisp: fennel with pomegranate seeds. 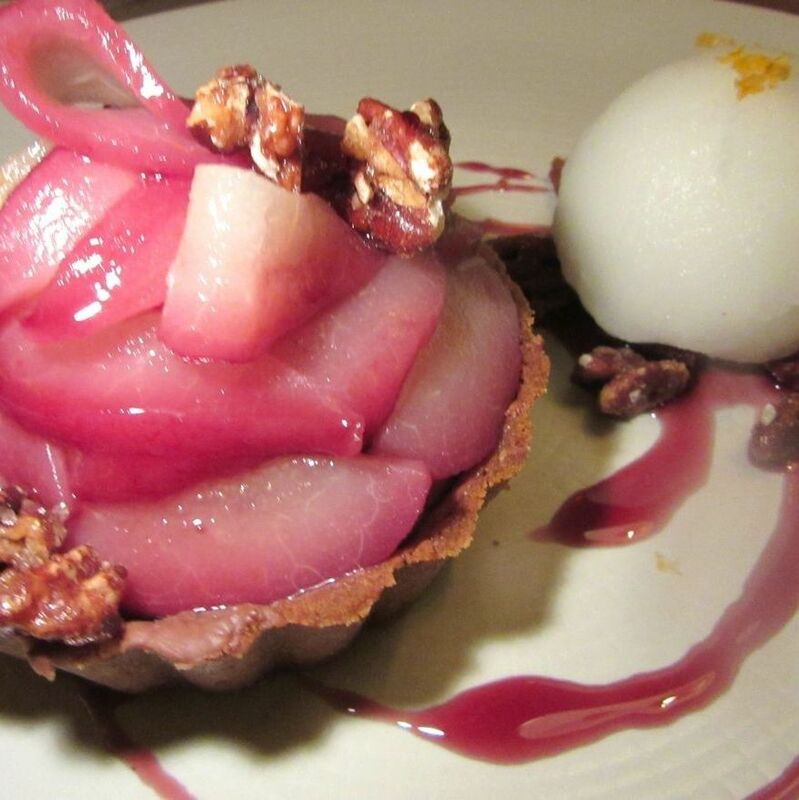 Linger for dessert? Sure. We were just two and not expecting that pasta. No way we could handle dessert. Though I always like the cleansing tang of lemon sorbetto. But the sweetly shy chef delivered his tiramisu himself, explaining why he liked Italian cookies better than ladyfingers. How could we refuse to taste? That’s about all you need to know to make the right moves at Prova. 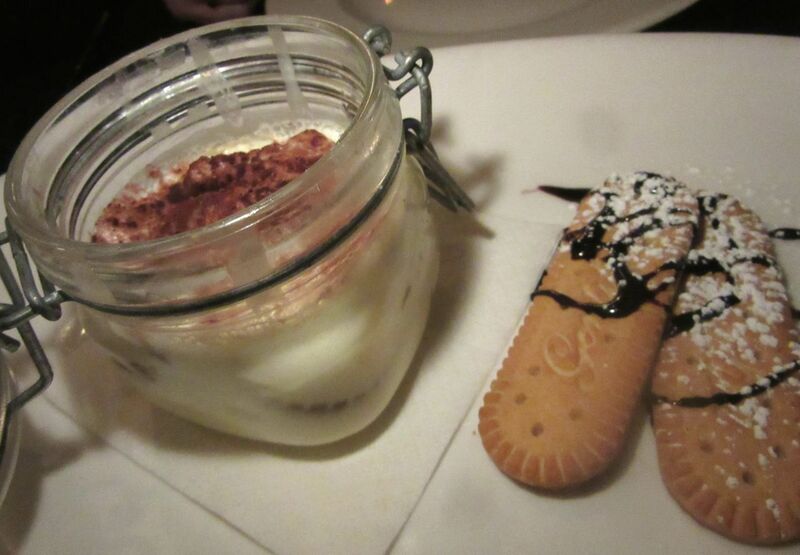 Chef Pasquale explains he prefers Neapolitan cookies to ladyfingers in his tiramisu. If you were a regular at Donatella’s when it opened here and watched it fade into the short-lived Heartwood, you may worry about Prova, even with so many partners (the chef included) committed to such grandiosity. It seems quieter near the kitchen till the crowd really build up. The oven has been newly tiled in red. Maybe the eggplant parm won’t be hot enough. Ours wasn’t. Maybe the chef’s seconds will take a short cut with the pasta when he’s not around. Maybe when Donatella is on the road, Maurizio will return from his travels and go berserk to see she has added meatballs and local lettuces to his original menu. She hesitated to make her moves till he left town. 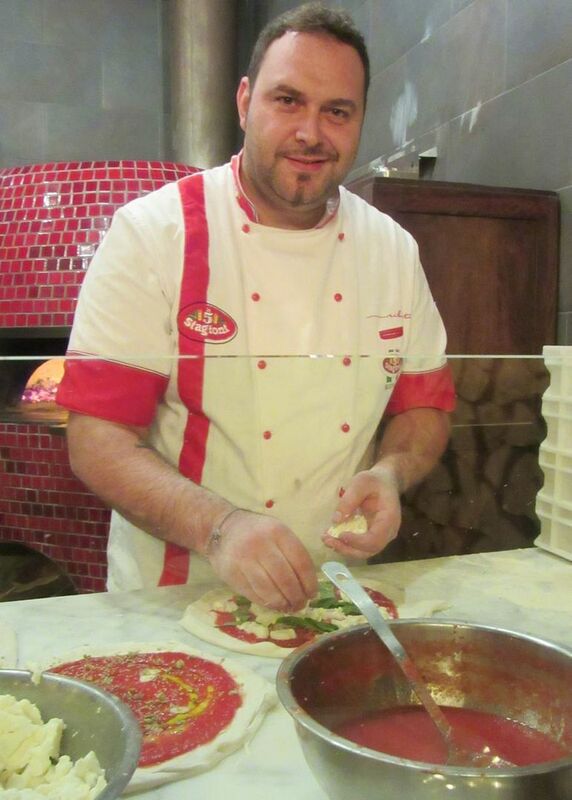 Maurizio expounds on the history of Naples and proper pizza. Manager Settani seems impressed. De Rosa is definitely brilliant. But he can be a tyrant too. Maybe the manager will turn down the lights so low you can’t see what you’re eating. Or maybe there will be votive lights all around because Donatella ordered them even after Maurizio said “never.” That will help a little. It’s not the same eggplant Donatella served originally but it would be good enough if hotter. But it wasn’t just a lack of candle glow that made it difficult to add the tip. It was that the receipt printer had run out of ink. We complained again to Donatella. She’d come in that evening for dinner with her husband the heart surgeon and baby Alessandro. That’s a good sign – and she lingered after they left. Another good sign. But after dropping off a votive candle, she seemed more concerned about her newly reopened bar with no name on Seventh Avenue. Donatella arrives for dinner with her cardiac surgeon husband and baby Alessandro. 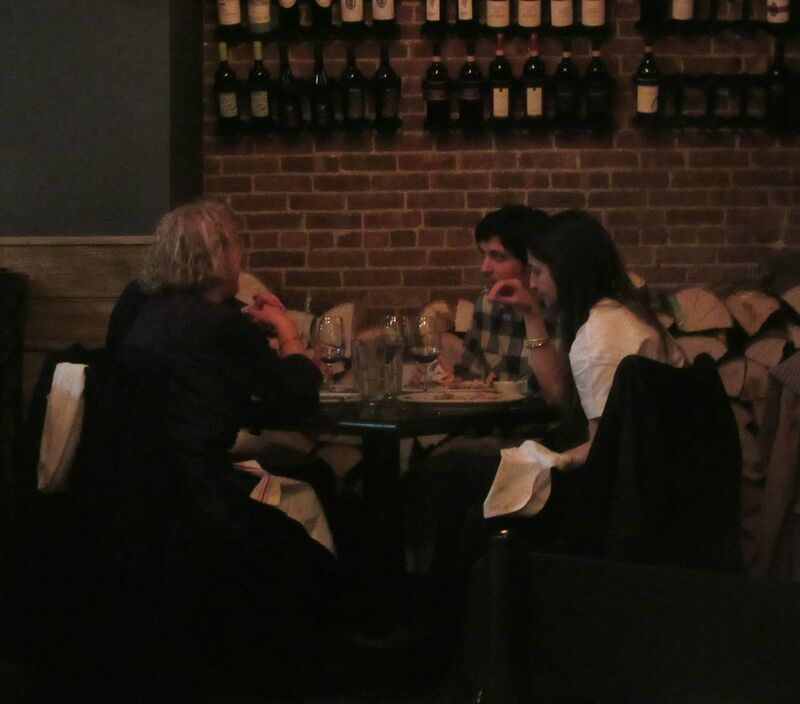 And Chef Pasquale and Rosario Procino still run Ribalta too. What happens when the dream team is on the road? On an earlier visit with seemingly no one in charge and no parade of brass trickling in, we ordered sorbetto and it never came. So we asked for the check and left. On my most recent visit, manager Francesco Settanni -- advising knowledgeably on wine by the glass -- insisted customers could count on him. No surprise, Campania rules the wine list. Settanni especially likes a medium-bodied white, Fiano di Avellino Kratos ‘13, for its “pleasant, fruit-sour mood.” Ask for an inexpensive red and he’ll suggest a $38 “food-friendly” Lacryma Christi DOC Carpino or in the medium range, a $68 Piedirosso Lucno, ’12. The Lucno is hand-picked, he notes, and aged in clay amphoras for 5 months. His personal favorite, is the deep-garnet Montevetrano ’09, “a super Campanian blend of Cabernet Sauvignon, Merlot and Aglianico at $175 for its "intense bouquet" of blackberries, cedar, black currant, licorice tobacco, earth and leather. Logs line the brick wall across the way as late comers settle at the kitchen counter. I’m not suggesting it’s a cinch to be a restaurateur, a wife, a mother, a devoted daughter in an old-fashioned Italian family, a celebrity chef, a television judge and a Home Shopping Network star with time to workout everyday. Maybe Wonder Woman could do it. And overseeing high-quality pizza while jetting the globe leaving miscellaneous humans to master the rituals of its daily upkeep is a task for Superman not for a mere Neapolitano no matter how brainy, nor how many anchovies he can leap in a single bound. 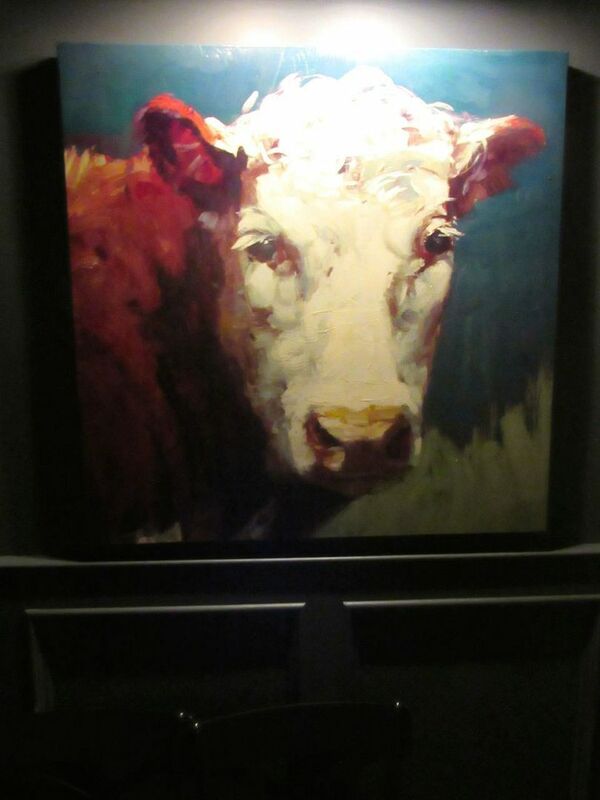 This cow guards the coat rack and a pair of rest rooms. The proof will be in the Prova. 184 Eighth Avenue between 19th and 20th Streets. 212 641 0977. Lunch Monday through Sunday noon to 3 pm. Dinner Monday though Thursday 5:30 to 10:30 pm. Friday and Saturday till 11:30 pm. Sunday till 10 pm.